My Dogs Love Me: Hmmm... Best Dog Food? 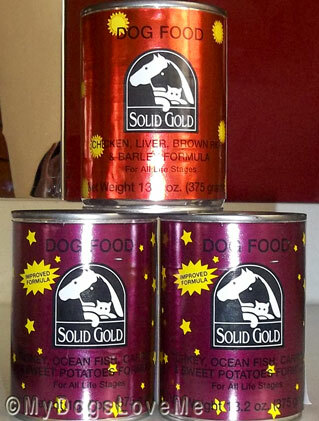 Back when Chooey had her mandible broken because of Rin, we had to change her diet from hard kibble to soft baby food with canned dog food. 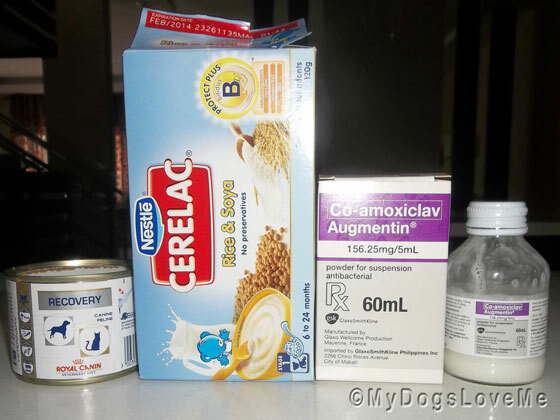 Royal Canin Recovery Food plus Cerelac equals Soft Diet to feed the dog with a broken mandible. It was hard for me to decide what dog food brand to buy because of the fact that I'm not an expert on dog food analysis. With so many ingredients being used in dog food- from filler-filled to the grain-free type- it figures that owners who aren't aware of these will either choose what their dogs love best, the cheapest among the bunch, or the most advertised in TV. 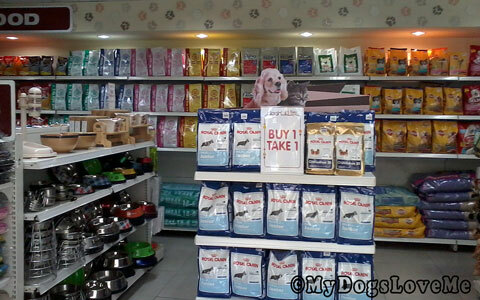 Dog food selection in Pet Express Cubao. I asked the sales person what people usually go for and he said that most pet owners choose Pedigree or Alpo. I asked him out of curiosity as I was already eying Petcurean Go! Natural Grain Free Chicken, Turkey+ Trout Stew and Solid Gold. Included among the wide variety of dog food displays were Holistic, Orijen, Royal Canin, Optima, Purina Pro Plan Robust, and a lot more. Honestly, what's a pet owner got to do? Of course, CHECK THE INGREDIENTS. We've just finished a can of Go! Natural dog food... It had trout in it and Chooey's breath smells like it! So finally, I decided to juggle between cans of Solid Gold and Go! Natural since the rest were usually kibble packs. P.S. I know I must be boring you with these silly dog rambles of mine. I promise to post something interesting on my next one. Chooey's doing fine. We dropped by the vet's office for a check-up. The vet even said that she's one tough cookie. That's after Dr. M reviewed her file thoroughly. Indeed she's super Chooey! After the wart removal and the Rin war, I'm thankful that her mandible's healing is going pretty well. Buchi was due for his second visit to the vet today. We had him groomed there due to the non-functioning clipper. Then, he was treated for the mange which involved a shot of Ivermectin. So far, we're on the path of recovery. And he's such a handsome bald boy now (hihi). SHE just googled for the best brands, and chose the ones that we have in Oz. I, Daisy, have an allergy to grain, so we get a grain-free. No problems. Our friends at the river get whatever's on sale that week and they are all healthy, glossy and rearing to go! So don't fret. There is so much choice these days. We like the James Wellbeloved kibble with a little fresh meat. I find this is the most gentle for Dip's colitis. We agree we are all are awash with choices and sometimes it is hard to figure out what is best. Have a terrific Tuesday. My peep is friends with the manager at the pet supply shop, she got advice from him on what to buy. BUT, since Alex joined the family, the peep has been talking about making food for us, like what Alex eats, she has the recipe! True. Baby cereal food can be a good substitute for pets that cannot consume solid food yet. 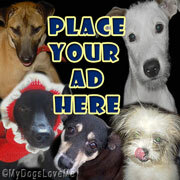 I use James Wellbeloved for both Sheba and the cats it brings there coats up lovely and soft, they all love it. I'm all about cheap kibble, but my mom makes her shis tzu's food once a month, freezing a few days worth at a time and leaving a container in the fridge. She boils down a chicken, tears it to bits, cooks brown rice, peas and carrots, adds brewers yeast. I'm not sure what else. But it's pretty cheap, easy to do, and freezes well. Honey loves it. I'm pretty sure she found a recipe online and played with it till she found something that worked for Honey. Good for Buchi and Chooey! We are glad to hear they are doing better. We like Halo's Spot's Stew (they have a cat and a dog version, and in both dry and wet varieties) because it has no fillers. The cats eat less and have lost weight without the mom restricting how much they eat. It costs more but they eat less. We think you get what you pay for. Thanks for stopping by! We always having the dog food debated. Thanks for the great info. So many choices. It is so difficult to choose, but we commend you for checking out the ingredients and making as informed a decision as possible. We're SO happy Buchi and (Super) Chooey are doing well. I love your posts. Food is an integral part of dogdom. I also have two dogs, Douglas and Dennis. At first, they ate pre-made dog food. However, they started to avoid these kind of dog food. A friend of mine advised me to cook food for my dogs because it is better for them. So I tried it and it was a great success. Up until now I still cook food for them and they became healthy and strong. I don't have any plans of giving them pre-made dog food ever again. Good luck for Chooey and continue to cook food for her. It's good that you are cooking for them. We used to cook for our dogs too. We've always considered it the most cost-effective way. Unfortunately, in Chooey's case, it wasn't possible since she could only lick stuff. Thank you for wishing us luck. She's all healed up now. We are glad she's doing a whole lot better. I hope Douglas and Dennis remain healthy for the rest of their lives as well. Royal Canin Dog Food is an excellent product. This dog food focus totally on the animal, with the aim of improving daily life and ensuring better health for dogs through nutrition. * Adapted kibbles (textures and shapes) for the jaws of the dog to make them easier to prehend and chew.